Do Full-Timers Spend More Than Home Owners? Is life on the road more expensive than “staying put?” Our lives changed dramatically when we sold the house, quit the jobs, and moved into full-timing. We did these all in pretty short order six years ago confident we could live within our means, far more inexpensively than in our big house. We don’t know what our expenses not working full-time would have been had we not started traveling. Actually, had we not sold the house and moved into the trailer we would still need our incomes — we couldn’t have afforded our house, cars, clothes, the life we had when working. We know we are spending less than when we maintained our 3,000 sf house in an historic neighborhood of Charlotte NC. We didn’t spend carelessly but housing and clothing were then far higher expenses for us than now. Food was less, medical care was less, and we otherwise were frugal. Still we spent far more than now. Not having space inhibits us from adding stuff into our house. Something we can’t eat or put into a laptop, we can’t much afford to buy it anymore. Our current budget for daily site rental ($20/night) includes electric, water, and sewer. Extra are telephone, XM radio, and heating gas (propane). We couldn’t match this low price for any decent apt or condo — but many could argue our present housing is below their definition of decent space, at least in quantity (188 SF gross interior). We’re comfortable and our budget provides what we need. Formerly we maintained a pickup truck and RV trailer, plus two or three cars. We didn’t drive so many miles, even between all three cars and the truck, but the taxes, tags, and insurance for the vehicles were fixed costs. Now we’re down to one truck and trailer, and no cars. Debbie does our accounting and together we discuss and agree on budget and adjustments to spending. Debbie keeps a pretty good rein on our finances. We don’t want to go to jail, so let’s not spend what we don’t have. Our clothing was much more expensive than now. We both worked corporate jobs, had nice collections of wool suits and work shoes. As well, we had clothing for bicycling, backpacking, visiting the beach and hanging out in cold weather too. Now? We have much simpler wardrobes designed around layers. A whole lot less clothing than when in a big house and working. We wear clothes until they wear out, which likely happens more quickly than “stationary” folks who have larger collections. We are working from a smaller set of choices so we probably wear any given item more frequently in a given span of time. A lot less clothing, and less cost. A surprising change from a large home to our rolling home is laundry. Have you thought about how convenient it is to wash three loads at once, then move them to two or three large dryers? We’ve been in and out of laundromats in as little as 90 minutes including all sorting, washing, drying, and folding. We’re not paying capital, repair, or utility costs for washing or drying our clothes. Sometimes we pay as little as $1.25 to wash and $0.50 to dry, or $1.75 a load. Works well, easily, and quickly too. Cheaper? If you figure it out, tell us. Our primary health care costs are health care insurance, funding an HSA (which is more like a savings account than an expense), and medical evacuation/relocation insurance (SkyMed). We see our dentist 2X per year and we have annual or bi-annual medical physicals. We pay for most of the visits out-of-pocket (with pre-tax dollars from the HSA), except where health care insurance now picks up costs for preventive care. We wasted little and thoughtfully considered purchases for goods and food. Our full-size kitchen with large pantry and fridge, six years ago, allowed us to buy wisely. Food costs could be lower for an organized homeowner who effectively economizes through bulk-buying and coupon discounts. Our current meager storage area and axle weight limits restrain us from enjoying much “buying ahead”. We pay more for the foods we buy than we would have when we had more kitchen. Jim formerly bought tools, hardware, materials, coatings for projects definite and potential. When we sold the house he gave away tools and materials. We no longer have the space or need for so much stuff. His small current stock of project materials includes mostly smaller things like wire terminations, grounding strap, nuts and bolts, solder, shrink tubing, and micro switches. Neat and small, and he’s very likely to use these things on a regular basis. Life in a stationary home need not cost more than our rolling style. And we’ve met full-timers who say they spend as little as half what we do. You choose how you want to live, where you want to be, what you want to do. You might have an inexpensive lifestyle with a low maintenance house and low taxes. We didn’t, so we considered our house too expensive to maintain and moved into this exciting lifestyle. We’ve not provided a numbered and methodical accounting of costs, but we tried to answer some of the questions raised recently. Your comments are most welcome. City parks can be novel camping experiences and have never been a problem for us. Finding fun and interesting stopping places is one of the joys of full-timing and a good reason to keep our itinerary a little slack. Driving along the state route through Kewanee Illinois a few days ago, we came upon a sign for a city camping park. We took the turn to find out about Francis Park in Kewanee. It was a neat surprise. As we drove up to the city camping park we caught sight of a petite brick and stone house with a metal dome over the entrance porch. We were struck by the beautiful grounds and the house seems placed just right on them. Fred Francis was a very talented and ingenious man who built Woodland Palace on 60 acres of timbered land northeast of Kewanee. He had lots of time to build the house. Elgin Watch Co. paid him a fortune in royalties for his watch spring engineering designs, and Frances retired at age 33 to build his home. Francis had time on his hands, having retired at 33 years, and was tremendously talented both as designer and craftsman. He used his time, a huge lot of it, on his home projects. Francis seems to have enjoyed the process every bit as well as the completion. He started building the house in 1890 and worked on it for 36 years. Everything is done so beautifully, he seems not to have rushed any aspect of the work. He ran all the wood moulding by hand with wood cut, dried, and milled from his 60 acre property. Woodland Palace’s water source is a 2,000 gallon cistern Francis dug and filled with yards of charcoal and sand to naturally filter rainwater. Several pipes in the cistern connected to a hand-driven demand pump in the house. Francis installed a pressure tank and heated water with a heating coil around the stove pipe. He implemented indoor hot and cold running water long before many Americans even thought about having an indoor toilet. Francis installed air conditioning for his house. He is said to have been the first in Illinois to mechanically air condition a house. He did this without electricity, too. He piped fresh cool air 350 feet through underground clay tile from the woods into his house, and used a windmill-powered fan to drive the air throughout the house. He also circulated warm air through the walls to increase comfort in the house. Other little details include his shoes — copper-soled boots and wood snow shoes. Francis was a physical culturist. His practices included walking up to 20 miles a day, staying very physically active, nudism, and walking barefoot to absorb important minerals through his feet. When he would travel to Chicago or walk on snow, he would protect his feet. Francis Park and the sixty acres of land provide a wonderful resource for camping and hiking. Sixty RV and tent sites include electricity and water and a dump station are available on the campus. A nice playground and very nice lawn area provide good play space for children. Plenty of firewood and available shade provide great relaxing space for everyone. This is nice place to visit and stay, we’ll gladly return. Woodland Palace is detailed, functional, pleasing to look at, and his work has held up many years. Camping cost us $16 a night with electricity. The Woodland Palace Tour is $2/person. A busy train track passes within a mile of the campground — don’t say we didn’t mention it — but we didn’t hear train horns once we shut our eyes. Want to read a cool little article about Airstream trailers’ trivia? The author may have missed on a few points but it is nice to see national media coverage for the brand. 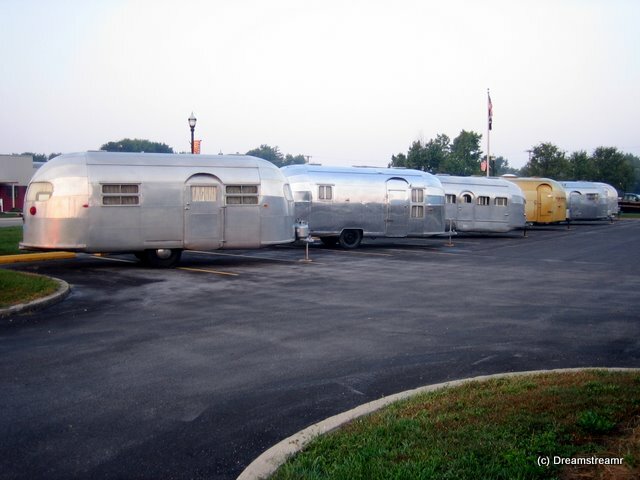 See Seth Porges’ article in Forbes.com here, 6 Things You Didn’t Know About Airstream Trailers.